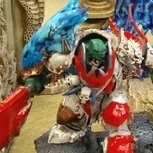 Hi all, looking into starting fyreslayers myself in the near future. I’ll likely end up with 20 or so HGB but I’m not sure what to equip them with? The poleaxes look great for mortal wounds but the Broadaxes seem a little more reliable. Which way would you guys go? I think you could have a lot of fun with a list like this. Highly mobile with Doomwheels and characters being skitterleaped about to support them, lightning cannons popping out of Gnawholes and some combat punch from the deceiver, highly doubt it would be competitive but a tonne of fun! So if you have a brick of 40 plague monks, with no buffs are you better off with blades or woe staves? Completely failed the last time I made a pledge, hopefully I’ll stay motivated and have a bit more time in April so- finish 20 plague monks and an Arch Warlock (fingers crossed I’ll have them done by the end of this weekend) 20 clanrats warlock bombardier 3 stormfiends. if I can force myself to sit down for at least an hour every evening these shouldn’t be too Unrealistic! also just realised if I knock out a warp lightening vortex as well I’ll have 1000pts fully painted so I’ll add that as a stretch! Well I did a pledge for February but life decided to get in the way. Still managed to do a little bit which I’ll share here and hopefully next month I’ll be able to lay a more structured pledge! @Kramer that’s actually an interesting point I hadn’t really thought of it like that. Currently I use units of 20 and am looking at going up to 40 man units soon, was planning on going spears as it seemed the obvious choice but when you factor in that they die to a stiff breeze or less blades may be the better option! Perhaps if you use 3x units of 40 and maybe death frenzy you can be confident you’ll have enough bodies to benefit from spears but maybe less than that it’s not worth it so much. Certainly worth looking into for me. Working towards this army atm, although I feel there are probably better options than the stormfiends. Gutter runners perhaps? Perhaps a verminlord? What do people think? So I cracked open my first box of plague monks today and there are tonnes of rats on the sprue. Anyone thrown these on bases and used them as giant rats? Are they big enough, is one big enough to fill out a base or are you better off with two? 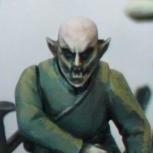 @Gwendar those rat ogres look fantastic! How do you think you will tackle bigger things like the screaming bell. Would love to see a verminlord with that scheme! Also how are you going to base them? Pics of the rat ogres please! I really like the sin city look you’ve got going there!